April Fools Day is our absolute least favorite time of the year because everyone thinks they're hilarious half-rate comedians, Kia included. Ooooh hahahaha! 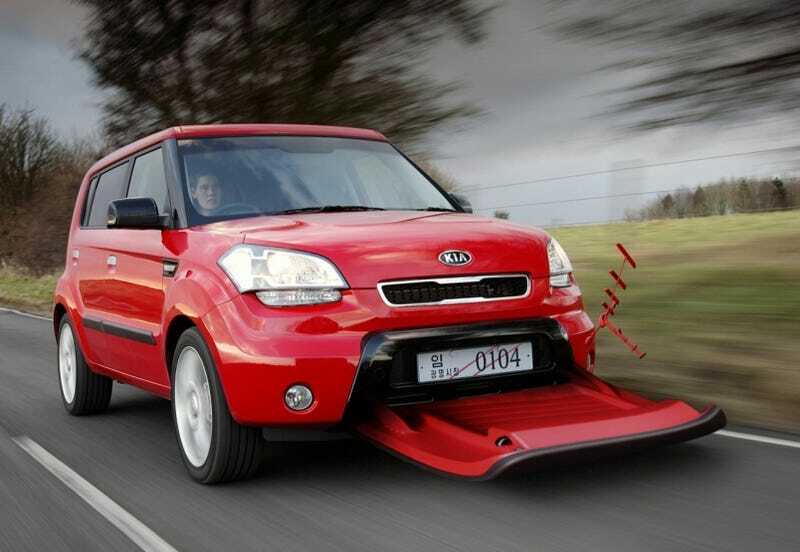 Look, Kia worked up a HILARIOUS press release and images of a totally outlandish Kia Soul! They are sooooo hip and clever! Everyone, rush out at buy one of their new products because they are so with it. Photoshopping stupid body work onto an otherwise noteworthy, cheap, but utilitarian vehicle is a perfectly good way to spend man hours. We'll just be in our boxers, standing on the proverbial porch of the internet shaking our fist at those damn kids on our lawn for the next two days. In a dramatic move aimed at delivering environmental benefits without expensive technology Kia has revealed its new Aero-Soul concept that reduces fuel consumption and exhaust emissions with a simple and low-cost system called Air Propulsion and Retardation Installation Line. Although unveiled on the company's stylish and fun cross-over Soul the patented system can be easily extended to all the company's vehicles and will even be available as a bolt-on accessory for vehicles already in use. The system relies on small sensors built into the front and rear bumpers which monitor external wind speed and deploy panels when the wind is sufficient to provide additional directional impetus according to the car's behaviour. So at cruising speeds if the wind behind the car is strong – such as in winter gales – the panels will harness wind power to provide forward motion. If the car is slowing or under braking the panels will deploy to provide additional retardation effort. Additionally a small electrically powered baffle can be lowered just behind the exhaust pipe under harsh braking to provide the kind of "reverse-thrust" normally associated with aircraft during landing – this element will only be available as a factory-fitted device. Systems Manager Avril Babo at Kia's Eco-Technology Research Institute in Mabuk, south of Seoul said: "The big problem with most emission reduction systems is that they are expensive. We wanted to come up with an answer that didn't cost the earth and could be retrospectively applied to cars already on the road. "Tests of this system at our Nong Dam facility have shown that during windy weather fuel consumption can be reduced by up to 25 per cent and emissions by anything up 40 per cent. Even in calm weather using the system simply under braking can result in reductions of 10 per cent and 15 per cent respectively. In perfect conditions – downhill with a following wind fuel use and exhaust gasses can be reduced to almost zero! Plus, brake-pad life can be extended by anything up to 50 per cent depending on driver behaviour, she added. The new A.P.R.I.L. system will be available on all vehicles ordered after midnight on March 31, 2010 and the accessory pack will be available the following day. Prices will be announced in due course.